The 12 Inch, fuel-injected TS-480i cut-off saw rental is an exceptionally powered saw and available for rent from the Duke Company in Rochester NY, Ithaca NY and Western New York. Versus the Stihl TS 410, this cut-off saw rental has 17% greater power due to the fuel injection system that is electronically controlled. 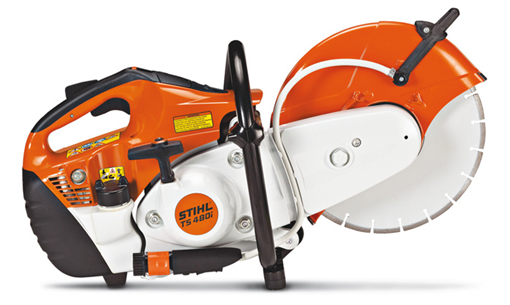 Professional concrete and masonry contractors rent this Stihl saw for its light-weight characteristics and its ability to power through tough jobs. Engine: generates power of 5.2 (bhp) horsepower. Advanced filtration and anti-vibration system. Weight: light-weight at 22 pounds. Cutting Depth at maximum = 3.9 inches. As one of Western New York’s leading Rental Equipment, Tool Rental, and Concrete Repair and Restoration supply companies, the Duke Team would be glad to assist you with prompt delivery, convenient pick-up and exceptional service. Call 585-292-9870 (Rochester NY), 607-347-4455 (Ithaca NY) or to view the Duke Company’s Satisfaction Guarantee and the Duke Company’s online contact form for immediate service.